Adult coloring books have been all the rage for the past few years. I admit I have jumped on the bandwagon (sort of), I gave some as Christmas gifts a few years back and have two myself. It can make us feel like a kid again or give us something more interesting to color while we play with the kids. There are a lot of claims out there about their benefits though. It is said that they are helpful in reducing stress and anxiety for starters. But is there really something to this or is it just hype? 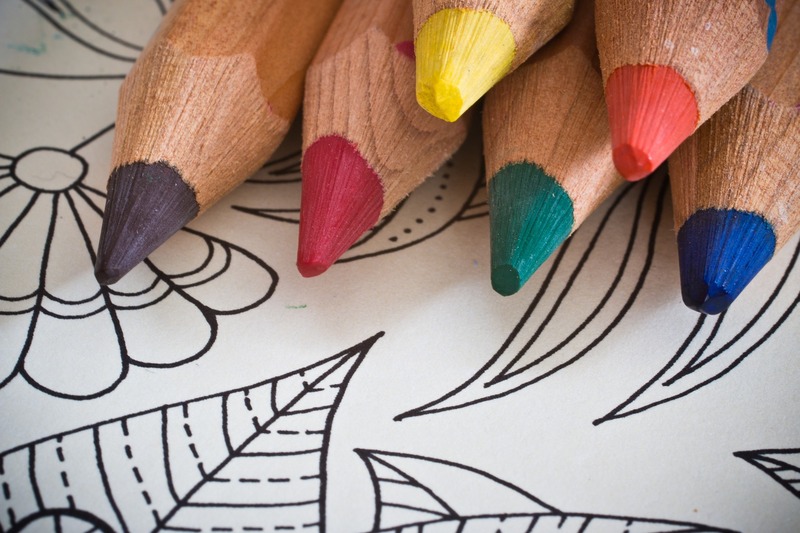 Believe it or not, researchers are looking into whether there are statistically significant results to prove that coloring has an effect on anxiety and stress. One such study had individuals either color a mandala (a geometric, concentric shape that is often used in meditation- those who have been in my office may remember that I have three images of mandalas over my desk), a plaid coloring page, or were given a blank page to color. Interestingly the study found that those who colored either the mandala or the plaid image both had statistically significant reductions in their anxiety where as those who were given a blank page to color on did not show any reductions. The two things that this says is that coloring does reduce anxiety but that not all coloring does. Researchers say that the coloring pages with repetitive patterns and symmetrical forms help to bring individuals into a state similar to meditation. It helps people to clear out their mind while having something to focus on which can be much easier for many people than just meditating. The key here though is to make sure that you are able to shut off your “monkey mind”. Monkey mind is the incessant chatter in your mind that is distracting and can often times be negative. Coloring can also be less intimidating than meditation. But how does coloring (or even meditation for that matter) help to reduce anxiety? It is a calming activity that helps you learn to direct your attention. Many people who experience anxiety have a difficult time figuring out how to stop thinking about the things that make them feel anxious. Others often say, “if it makes you anxious, then just don’t think about it”. But this is easier said than done. As I’ve already said, the coloring of the shapes can help people clear their mind out in the moment, but it can also help them learn to do so at other times when they are not coloring. Whether you are convinced or not, it doesn’t hurt to give it a try as the science seems to back it up. It is a pretty inexpensive coping skills/stress reliever as all you need is a coloring book (or pages printed from online) and some coloring pencils! ← Did I Choose The Right Partner?